The Me 262 has long been a favorite subject of modelers and aviation enthusiasts, and there are many options available to those who would like to place a scale representation of this historic aircraft up on their bookshelf. Paper or plastic, wood or resin ... the chances are, whatever you are looking for, we can point you in the right direction. From the least expensive to the most exotic, here is a quick rundown on what is available in today's market. If you don't have a lot to spend, or are just looking for something fun to do, it's hard to beat the Fiddler's Green Me 262 paper model. This "kit" consists of an Adobe Acrobat™ .pdf file which you can download and print at home on any color printer. Then simply cut out the pieces and paste, per the printed directions. Fiddler's Green offers a wide variety of paper aircraft models for a minimal fee; however, they have kindly released their Me 262 without charge. You may download this model from Fiddler's, or directly from our server. Note: this is a 550 kb file ... please be patient. We intend to prepare additional material for this section in due time; however, because of the vast range of kits and aftermarket accessories available, we recommend that you visit a dedicated scale modeling site such as Brett Green's HyperScale. Sometimes, there really is no substitute for a professional wood or resin scale model. Pictured at right is a 1/32 scale mahogany model from Showcase Models. It comes complete with a display stand, and is available right here at the Stormbirds ANNEX. Visitors ordering this (or any other) model from the ANNEX will automatically receive a 15% discount off of the manufacturer's retail price. 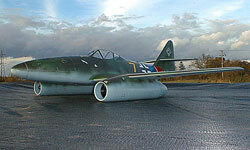 Stuart Mackay Models in the UK is offering Twin Electric Ducted Fan or Twin Turbine models of the Me 262. The models are constructed of silver epoxy moldings, complete with all surface details -- to include flush rivets, panel details and other details of the original. 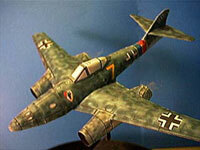 As an option, the model can also be pre-finished in an airbrushed, authentic Luftwaffe color scheme. The fan clicks into its location and the entire inlet and outlet duct is already molded into the motor nacelles. Hinges are elastic flap on both ailerons and elevator. The builder's work is minimized to the installation of the fan unit and avionics to get this classic jet in the air. Equipped with the optional retractable undercarriage system (with brakes for Turbine), the Me262 takes off from smooth surfaces. The highly efficient aerodynamic design allows for five minutes (2400 maH Nicads) of high speed (over 100 mph!) flight, including aerobatics. While low speed handling and stability are outstanding, this model is not recommended for beginners. 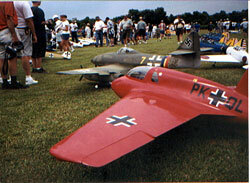 Stuart Mackay's Messerschmitt 262 (shown above). Airframe construction: One piece silver epoxy sandwich wing panels (with ailerons gapless hinged) with molded nacelle/ integral fan duct, plug in tail surfaces with elevators hinged, silver epoxy fuselage with carbon reinforcements and separate battery access hatch. Clear molded canopy with epoxy frame. The Turbine version receives additional strengthening of the composites to cope with the higher speed and flight loads. "You might be interested in my ME 262. It is an Airworld model from Stuart Mackay. The engines are MW54 turbines producing 12 lbs thrust each (similar to the RAM 500). The plane weighs 23 lbs dry and holds 2 litres of fuel. We had our first flight in mid-April 2002 at an old RAF airfield. The plane sounds and looks great. It took off and flew really well, despite a high wingloading. The landing was made without flaps as there was enough to do to get used to the plane and how it handled. I guess that it is the next best thing to the full size. We were really concerned about the handling with an engine cutting out. I know the asymmetric thrust can make it a real problem. In then end we fitted a gyro on the rudder to give instant help if it happens. Even the sound is right. I have some photos and a short video at http://www.wren-turbines/pictures_planes.htm." John can be reached at john1@wrighta.demon.co.uk. 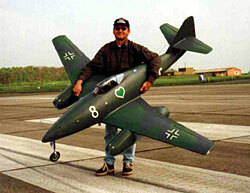 The Kranz R/C Me 262 available from Germany is a composite (fiberglass) semi-kit with an excellent scale appearance, although this kit is designed for the experienced r/c modeler. Special Note: An updated version of this kit will be available in late 2007. It will be a complete redesign of the internals and end up in an almost ready to fly jet, especially made for the experienced competition flyer. It is a fully molded kit with ALL details like rivets , panels, hatches ....... Special retracts, decal sets, pilot figures, cockpits will be available also. 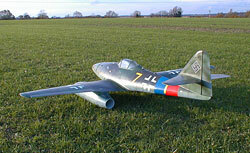 Pictures of this model have been published in the English model magazine "Radio Control Jet International". Editor: simon.delaney@traplet.com. The quality of this kit looks very good. Production is limited, however, and these kits are sold primarily in Germany. RC Modeller Horst Niemann from Germany recently sent us this photo of his completed Kranz Me 262, powered by a pair of gas turbines. The wingspan is 262 cm., with a flight-ready weight of 21.5 Kg (including 4 liters of kerosene). Niemann use two "AMT Mercury HP" gasturbines (2 x 9,5 Kg.) for his kit, which features, electrically retracted landing gear, gear doors and wheelbrakes. The plane is is complete with all surface details, and tops out at about 240 km/h! First flight was 8 May 2002. Niemann can be reached at dr.niemann@t-online.de. Dr. Niemann was kind enough to send us a .mpg video of a flight his Kranz 262 made in November 2002 at a NATO airbase in Ahlhorn, Germany. You can view his "low pass" footage HERE, but good luck convicing yourself that this is just an RC model, and not a real Me 262! 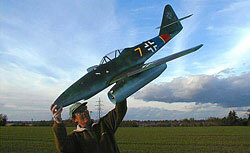 To see another completed Saitta kit, go to www.rcwarbirds.com. Click on "fighters," then "other, misc." 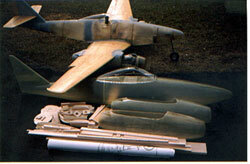 If you scroll down to "Rob Bailey's Me 262," you will find a finished example of this model. Note: We regret that Stormbirds is not able to provide scale drawings or other technical plans for construction of R/C aircraft; however, Flugzeug North America carries a full line of ScaleCraft blueprints, including sets for the Me 262. Many R/C builders have reported that these plans have proven helpful. © 2008 Stormbirds.com All rights reserved.